I took last weekend off from woodworking and mostly just putzed around the house. The Watco Danish Oil felt dry and smelled dry mid week but I waited until this last Thursday to start putting polyurethane on it. I got a second coat on it Friday and hoped to get two coats a day on it Saturday and Sunday. Unfortunately my Saturday morning coat wasn't dry Saturday evening so I only got one coat on it Saturday and today (Sunday) I didn't even try to get two coats. It's still pretty cool here and it's possible that I may not have thinned the polyurethane as much as I normally do. In any case it will take however long it takes. Getting to the bottom and reaching the top is a little awkward. The top of the carcass will be covered by the dresser top - which is yet to be made - but I want to seal it with polyurethane anyway. The plan is to finish covering the sides then I'll tip it onto it's back and put a few coats of polyurethane on the top and bottom just to make sure everything is balanced. I'd thought that maybe I'd build the top of the dresser this weekend but instead I let myself get distracted. I spent a few hours Saturday in the workshop getting the drawer fronts sanded so they are ready to come up to the finishing room. At this rate, I'll probably have the dresser carcass finished this week and be putting Danish Oil on the drawer fronts and door next weekend. If they take two weeks to get covered I effectively have three weeks before I need to build the dresser top. There's also a shelf I need to build for the large opening. I've been putting that off as well because I don't want to have it sitting around taking up space. No pictures this week. It pretty much looks the same as in my last blog. The canoe has to be a summer project. I will not be able to get it out of the basement so it is going to have to be built in the garage. I'd like to finish it in one summer because it will be much easier to store as a boat than as a half-finished boat. This summer will probably not be ideal since I will probably be looking for a new job come fall. I'd rather not have the distraction of a boat. The router table is somewhat higher on the list. A number of years ago I needed a router table so I built one in an evening. It's basically a sheet of plywood with some braces underneath to keep it stiff. It sits on top of a pair of sawhorses. It's convenient in that I could take it apart and regain the space it is using but it tends to just stay set up all the time. I'd really like something more mobile and more convenient. My plan is to make an entire bedroom set. I mentioned making the bedframe that goes with my dresser and nightstand to my wife and she said she'd rather have a new dresser before the bed. I'm a little sick of working with quarter sawn white oak so that's likely to wait for a bit. I've got a few kitchen cabinets in my workshop that were probably moved down there when the kitchen was remodeled in the mid 80's. I'm guessing that is that case because my house was built in the 70's which matches the dark walnut stained cabinets in my workshop and I've got crappy mid-80's style cabinets in my kitchen. I've got a corner of the workshop that is inaccessible and not well utilized. What I'm thinking is if I rip out the cabinets I'll gain floor space I can use to put tools. Half of my workshop has walls framed with 2x4's 16" on center covered with T1-11 plywood. The other half has bare concrete block walls. I'm thinking of framing and paneling the other half, putting in some additional lumber storage and maybe a workbench. These might get done over the summer but I don't know if I want to commit to them just yet. They're going to take a little bit of time. Also, I think I might rather have some of the other things on my list first. I've got multiple gaming consoles and currently they are sitting on the floor. I'd like to get them up off the ground and into a proper piece of furniture. I don't have any pre-made plans for what I want so I'm going to have to design something myself. Since this piece will be going into one of the nicer rooms in my house I want the piece to be attractive; however, I also don't want to put a lot of effort into it. My plans are going to have to balance utility, ease of construction and appearance. Basically I'm not quite ready to start on this yet. I've been wanting to make one of these step stool chairs for a few years now. They really appeal to my frugal nature and liking of things that multi-task. From my experience they make a relatively uncomfortable chair and a slightly inconvenient step stool. I've got a friend - let's call her Heidi to preserve her anonymity - who isn't what you would ever refer to as statuesque. Okay, she's short. She also has rather tall kitchen cabinets. This confluence is perfect. I want to make one of these chairs, Heidi could use a stool in her kitchen. I think this is what I'm going to make next. The construction doesn't look that hard so it'll be a good summer project as yard work and other outdoor activities start to take precedence. I'll be able to putter away at it whenever I have time. 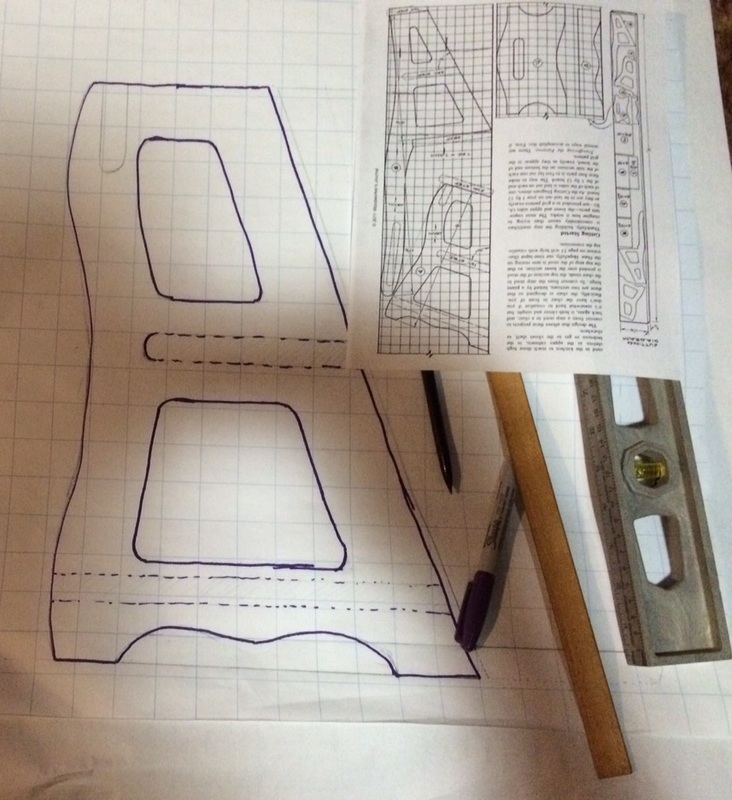 I started the process Saturday afternoon by transferring the design plans to paper with a one inch grid. I started by trying to follow the plans weird skewed angle and decided it was too annoying. I restarted aligning the drawing with the grid. Since the drawing was scaled 1/4" to the 1" I was able to use a ruler to measure offsets and transfer them to my sketch. As the plans say, there are only a couple of important things to get right. The angle on the two pieces needs to be consistent - 70 degrees - and the height of the chair needs to be such that top of the seat back rests on the ground when folded into the step stool shape. I'm happy with how it came out, but... I should have started closer to the left hand side of the paper. I don't have room to finish the other half the stool. It isn't a big deal. I can just tape another sheet of large graph paper to the right hand side and span two sheets or I can transfer what I have to a new sheet and move on. I just haven't done one or the other because I was working on the floor and my back started hurting. And it was time to go play some Mass Effect 3 anyway. I plan to draw out the other pieces then cut them out of 1/4" hardboard. I'll use the hardboard to trace the final pieces and as a template to use my router table and a pattern bit to get the pieces exactly the same.